You see that today there are flowers: flowers that speak of joy and gladness. In some places, Easter is also called “flowering Easter,” because the Risen Christ flowers: he is the new flower; our justification flowers, the holiness of the Church flowers. Therefore, many flowers — it’s our joy. We celebrate Easter the whole week, the whole week. And therefore all of us say to one another once again the wish of a “Happy Easter.” We say together: “Happy Easter,” — all! [They answer: Happy Easter!] I would like us also to say Happy Easter — because he was Bishop of Rome – to our beloved Pope Benedict, who follows us on television. 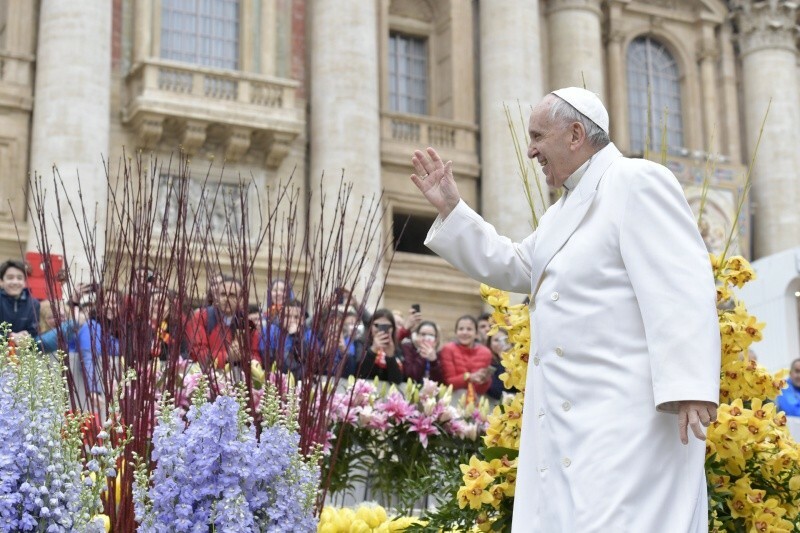 We all say Happy Easter to Pope Benedict [They say: “Happy Easter!”] and loud applause. From the celebration to life, therefore, aware that the Mass finds its fulfillment in the concrete choices of one who is personally involved in Christ’s mystery. We must not forget that we celebrate the Eucharist to learn to become Eucharistic men and women. What does this mean? It means to let Christ act in our works: that His thoughts be our thoughts, His sentiments ours, His choices our choices. And this is holiness: to do as Christ did is Christian holiness. Saint Paul expresses it with precision, speaking of his own assimilation to Jesus, and he says thus: “I have been crucified with Christ; it is no longer I who live, but Christ who lives in me; and the life I now live in the flesh I live by faith in the Son of God, who loved me and gave Himself for me” (Galatians 2:19-20). This is Christian witness. Paul’s experience illumines us also: in the measure in which we mortify our egoism, namely, that we die to what is opposed to the Gospel and to the love of Jesus, greater room is created in us by the power of His Spirit. Christians are men and women that let their soul be enlarged with the strength of the Holy Spirit, after having received the Body and Blood of Christ. Let your soul be enlarged! Not these narrow and closed, small and egoistic souls, no! Wide souls, great souls, with great horizons . . . Let your soul be enlarged with the strength of the Spirit, after having received the Body and Blood of Christ. Because Christ’s real presence in the consecrated Bread doesn’t end with the Mass (Cf. Catechism of the Catholic Church, 1374), the Eucharist is kept in the Tabernacle for Communion <to be taken> to the sick and for silent adoration of the Lord in the Most Blessed Sacrament; Eucharistic worship outside of the Mass, be it in a private or communal way, helps us in fact to remain in Christ (Cf. Ibid., 1378-1380). Therefore, the fruits of the Mass are destined to mature in everyday life. We can say so, forcing somewhat the image: the Mass is as the grain, the grain of wheat, which then grows in ordinary life, it grows and matures in good works, in attitudes that make us similar to Jesus. So the fruits of the Mass are destined to mature in everyday life. In truth, enhancing our union with Christ, the Eucharist updates the grace that the Spirit gave us in Baptism and in Confirmation so that our Christian witness is credible (Cf. Ibid., 1391-1392). I am happy to receive the Deacons of the International College of Jesus of Rome and the youngsters of the Profession of Faith from the dioceses of Milan and of Cremona. I encourage each one to live the faith coherently, witnessing it every day with charitable gestures. I greet the Group of the Golden San Donnino Prize of Faenza and the Parishes, especially those of the Most Holy Immaculate Mary of Pontecagnano-Faiano, Mary Help of Christians in Portichetto-Luisago and the Most Holy Trinity of Naples. I hope that this meeting is for all a renewed occasion of adherence to the risen Jesus and His teachings of life. A special thought goes to young people, the sick and newlyweds. Christ has overcome death and He helps us to accept sufferings as a privileged occasion of redemption and salvation. Try to live the Easter message, witnessing in life’s places peace and joy, gifts of the Risen One.